Winter nymph season is upon us, and I lost many flies to the bottom last year (which seemed to be the only way to catch fish). I tend to just straighten my rod and pull when I am hooked, because if I try to save the fly I thrash around a bunch and ruin the fishing. Every time I break off, however, I have to re-tie my double nymph rigs and lose fishing time. Do you guys have any advice for finding the balance between catching fish, freeing flies, and losing complicated double nymph setups? Someone wiser than me once said, “If you aren’t losing them, you aren’t using them.” It’s a necessary price we all pay to catch fish that are reluctant to move far from the bottom for a meal. First off, though it may seem obvious, if you are fetching bottom drift after drift, take some time to adjust your rig. Start by adjusting depth first as this is the easiest fix with an indicator rig. I generally move my indicator closer to my flies in 6 inch increments until I find the sweet spot. If you continue to hang up, try removing some weight. This can be accomplished by removing (or downsizing) split shot size, or switching out heavily weighted flies for a lighter variation. Your position and angle can be a game changer too, especially in places with significant wood and geological obstructions. These obstacles can provide great habitat where the reward outweighs the risk when a large trout comes into view. Sometimes a stealthy step or two in either direction can make a huge difference in presentation. You’re right that rigging can be time consuming, but it is in fact possible to get faster. Here’s a great exercise to improve rigging efficiency. Keep a spool of tippet, nippers, and some flies in a bowl by your TV remote. Next time you’re watching your favorite program and the commercials start, see how many of your go-to knots you can tie during the break. Repeat this exercise regularly and soon you will be speed rigging like a guide! If you expect temperatures to put a crimp in your dexterity on the water, you can eliminate cold fumbling hands by pre-tying some of your favorite double nymph combos at home. Whip up a dozen different two fly setups, in various weights/patterns to cover a variety of water types and depths on the stream. Avoid a tangled mess later, and store these pre-tied rigs properly. There are multiple products out there designed for this specific purpose. I still use a set of “rig keepers” purchased from Orvis nearly a decade ago that are still going strong. A cardboard toilet paper roll or plastic hair curler “borrowed” from the wife’s closet make suitable transport as well. The majority of snags I encounter while nymph fishing can often be freed with minimal loss by pulling the rig upstream from where it hung up. If not feasible without disturbing the fish, before you point the rod and pull, try this. A tight-looped roll-cast will transfer energy via the loop above the water and upstream beyond the snag to free it. Face the snag with spare line off the reel. Bring your casting hand back slowly to set up a roll cast. 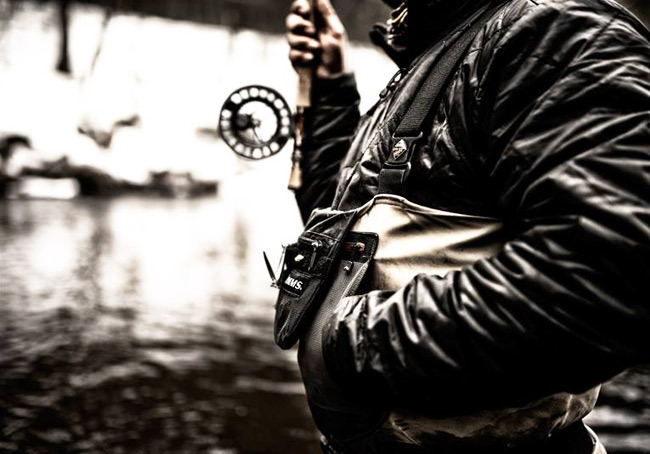 Make sure your rod position stops high and off to the side (hand above your shoulder) and slightly behind your body forming an over-exaggerated D-loop just off your hip. Begin your forward casting stroke slowly, accelerating to high crisp stop. Adding a sharp haul at the acceleration part of the stroke will give additional power and range to free your flies. If you find yourself hanging up more often than you’d like, my first thought would be to try a bottom bouncing rig. This rig consists of using droppers to attach your fly and using the terminal end of the leader to add your weight. Meaning, your weight will be on the very end of your leader with your flies hanging on droppers immediately above the weight. The concept is the weight will dredge along the stream bottom, which in theory should snag less than a pair of flies. This will allow you to drift your flies close to the bottom while reducing the chances of hanging up. There’s a number of ways to set this rig up, but the most basic is to start with a 5-7 foot tapered leader. When you attach the first length of tippet with a surgeon’s knot, leave the tag end of the heavier line long–you’ll attach your first and largest nymph to this dropper. Add another length of lighter tippet and repeat this process with the smaller nymph. Now that you’ve got two flies tied on droppers, it’s time to attach your tippet ring and your weight. One key to remember is the concept of “weakest link.” Meaning, you want the last portion of your leader–the portion with the shot attached–to be your very lightest tippet. When you break off, it will be at the ring, which means the rest of your rig will stay intact. I almost always fish a single fly when I’m rolling scuds or other heavy nymphs along the bottom. That’s because it’s absolutely inevitable that you will lose bugs when bouncing along the stream bed–and losing one is less painful on the pocketbook. In addition to going with a single hook rig, the type of hook can also play a key role in reducing hangups. For winter dreading activity, I like a hook that rides hook-point up as the fly sinks. Fishing a tungsten jig head fly keeps the number of lost flies down a bit while still allowing you to explore the bottom. Tungsten scud bodies accomplish the same thing. In either case, tying your favorite nymph patterns with these hooks means fewer hangups. Another thing you might consider doing is using tungsten putty instead of shot. Molding it into a longer tube shape can help the weight slide over and between rocks, and the chance of losing your putty and not the fly helps keep lost fly count down. Finally, if you do get snagged, apply upstream pressure on the snagged flies. In many cases, they tend to pop off the snag. It’s a fact that if you’re going to be effective with your winter nymphing, you need to get your fly down to depth. Inevitably, you’re going to lose some flies. But there are things you can do to lose fewer. First, you need to adjust the amount of weight for the water you are trying to fish. This sounds pretty obvious, but I see a lot of anglers set up with a certain amount of weight, and they don’t change the amount all day. In my opinion, you need to adjust the weight to the depth and speed of the water you are fishing. In other words, if you hook up a couple of nymphs and two BB split shot, and on your first cast and mend your rig goes to the bottom like a boat anchor and you get hung up, take some weight off. Having a split shot selection with several different sizes of shot is useful for making these adjustments. I generally start with a small bit of lead and keep adding weight till I get to the point where 1) I am catching fish or 2) at the deepest point of my drift, I am making occasional contact with the bottom. If I’m not touching the bottom at all, I add some more. As you move to new water, you may need to adjust the weight, add it or take it off. The other tip is if you’re dropping a nymph off the bend of the hook of the top fly, use one size smaller tippet on the bottom fly. So, if you do get hung up, this might help you avoid losing two flies at a time. The other bit of winter nymphing advice is that the feeding time window for a winter trout is generally pretty small. On many days, I’ve found that you might get 30-45 minutes when the fish are active. Remember, you’re dealing with cold-blooded critters whose metabolism is tied to water temps. If the water is too cold, down in the mid-30’s, it’s going to be tough sledding. If temps creep up into the upper 30’s or over 40, they’ll be much more active. Finally: don’t be disdainful of the Mountain Whitefish. They’re a salmonid, and they can save many a winter’s day on the river! When it comes to winter nymph fishing with indicator rigs, losing gear is a part of the process. After all you’re bouncing weight along the bottom with your flies barely inches above (if that much). You’re constantly in the danger zone. To minimize gear losses, and the lost time in re-rigging, there are a number of things to remember. #1 Don’t fish in snaggy holes. The first time you fish a pool, pay attention to the hangup spots and learn to avoid them. I bypass a lot of places you would want to put a fly just because my experience has taught me that every time I put my rig through that particular drift, it gets hung up. #2 Use tungsten putty. Expensive? Yes. Worth it? Absolutely. A blob of tungsten putty gets your rig down faster, doesn’t hang up as easily as lead shot, and pulls free more often. The small amount of flexibility that it has allows it to give enough to pull free from rocks and crevices. Shot doesn’t. You can also adjust your weight quickly, adding and taking away as needed. It’s also reusable. There are a number of brands, all $10-$15, that are quite similar and interchangeable. Crimp a tiny piece of shot above the knot to your tippet , and use that as a base for your tungsten putty. I generally run my tippets about 16″ to the first fly, and the 12″ to the point. #3 Make your rig smart. Use heavier tippet to your nearest fly than to your farthest. I usually have my leader down to 3x where I make my connection to my tippet. That is also the junction where I will attach my weight. Seeing as I most often fish small flies (#16-22), I will make my first fly past the lead larger, and the second fly (point) smaller. That means I’ll run 5 or 6x to the first fly, and then 6 or 7x to the point fly. That way, if you snag your point fly, the lighter tippet should give first, resulting in only one lost fly. #4 Read the water. Winter trout will hold in different places than you are accustomed to finding them. By late winter especially, many of them will often congregate in certain spots. A few years ago a friend and I took turns on one short run and caught no less than 20 trout in about as many minutes. Although there was good looking water both upstream and down, that was where the fish were. Pay particular attention to dropoffs where riffles dump into pools, and small depressions in riffles. Winter fish are often right out in the open, as there is relatively little to eat at that time of year and they will sacrifice security for food. #5 Wade in and get it. If I get hung up, often I’ll just wade in and kick it loose. Even if there is a fish about, they will probably move back into that slot after a few short minutes. What difference does it make anyhow? You are winter nymphing, and probably have the whole river to yourself! When it comes to fishing effectively while indy fishing, line control is hugely important. A good drag-free drift will not only better imitate various foodstuffs in the benthic flow, but it will also result in fewer hang-ups and lost flies. There are several reasons for this. First off, a good drag-free drift allows you to fish deep with less weight, and less weight will always result in fewer hang-ups. Sure, it’s easy to get to the bottom when you’re loading the leader up with weight, but that weight also makes it much easier to get hung up. Next time you’re out fishing, challenge yourself to focus on line management, both on the cast (think reach casts and aerial mends) and during the drift (reading the current and stack mending). Not only will that drag-free drift get you deeper, but it can also result in fewer hang-ups, largely because of where you are likely to hang up in the first place. If we imagine a drag-free drift directly downstream of the angler, any hang-up is going to happen at the front of the obstacle, in which case it can be dislodged by pulling the fly upstream. However, with less-than-ideal line management your flies are dragging toward you as they are moving downstream–there’s a subtle swing motion happening throughout the course of the drift. With this type of drift, your fly is going to catch not on the front of the obstacle, but rather toward the middle or back of the obstacle on the side facing away from you. And that’s the worst spot to be hung up.